Form Description: Whenever the winter weather starts to roll around, you really should begin getting things ready to face the new challenges that come with the cold and snow. One of the most important things that you can prepare is your vehicle. That is where this Vehicle Winterization Checklist can come into play. Not only will you find all the necessary items that you should look at, but also plenty of space for you to add any other items you want to have looked at. It never hurts to be prepared. If there is a single drawback to keeping large amounts of information on a form, it has got to be how easy it is to get distracted and confused about what is on it. One way to combat that problem is by using a Checklist that has numbered lines. This particular edition of the form has been created with those numbered lines to help you later on reference the information that you have entered onto it. 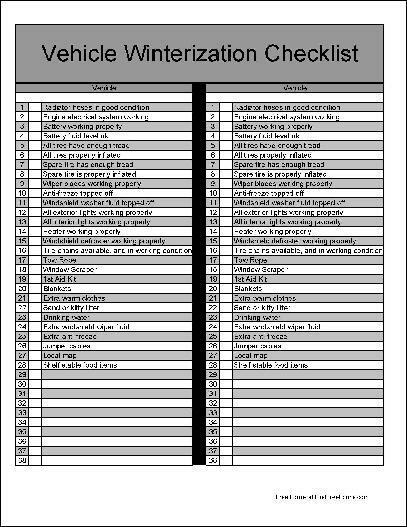 This form ("Numbered Row Vehicle Winterization Checklist") is associated with the following keywords: home, automotive, car, truck van, suv, winter, preparation, basic, numbered row.